Sometime in the next few months, the Ivanpah Solar Electric Generating System will flip the switch on the largest solar plant of its kind in the world: A 377-megawatt, 3,500-acre solar thermal energy system. It's located in California's Mojave Desert near the Nevada border and it's ridiculously big. I would suggest going to check it out in person during your next Vegas binge weekend, but from the 15 freeway it's little more than a silvery blur—a rippling, mirage-like, silvery blur that feels like it might sear your retinas if you look at it too long. So it's a good thing they've just posted this incredible virtual tour. A boiler atop one of three towers where the mirrors focus the sun's light. It really does glow white-hot like this. Unlike traditional photovoltaic cells, where semiconductors create an electronic circuit to convert solar radiation into energy, Ivanpah uses "heliostats," or giant computer-controlled mirrors, that focus the sun's energy onto boilers located atop 459-foot towers, creating steam that powers turbines, thus creating energy. The water is then air-cooled and recycled in a closed-loop system. Heliostats are mechanically moved as needed to maximize the sun's reflection. Since photovoltaics are static and have to be positioned very precisely, the heliostats are more low-impact, requiring minimal land grading. The plant estimates it will reduce carbon dioxide emissions by over 400,000 tons per year, the equivalent of taking 2.1 million cars off the road during its 30-year lifecycle. It's like a funhouse! Heliostats waiting to be put into place. When finished the plant will have over 300,000 heliostats, or enough mirrors to replace all the windows of the Empire State Building 54 times. The heliostats are assembled in here, using metal poles which are drilled into the ground. Ivanpah will power over 140,000 California homes during peak hours. The plant also features investors like Google and a $1.6 billion loan guarantee from the Department of Energy. Here's where "pad bonding" happens, attaching the mirrors to their steel frames. But it hasn't been all sunshine and Google investments for Ivanpah. After determining that the habitat was threatening 200 desert tortoises, the tortoises were relocated to other parts of the Mojave Desert at a scandalous cost of $50,000 per tortoise. Here's a video of construction, where you can watch the mirrors spin into place like a giant disco ball. Last month, President Obama's climate action plan set a goal to permit enough wind and solar projects on public lands to power six million homes by 2020, and from the number of new projects underway, it looks like it might happen. About an hour northeast, construction has started on Copper Mountain 3, a 250-megawatt, 1,400-acre photovoltaic plant outside Boulder City, Nevada. This is the third phase of a massive development will also be one of the largest solar plants in the world. SOLAR POWER SMACKDOWN, y'all. But they both better watch their backs: The Blythe Solar Power Project, a 485-megawatt, 7,000-acre photovoltaic project is expected to start construction in 2014. 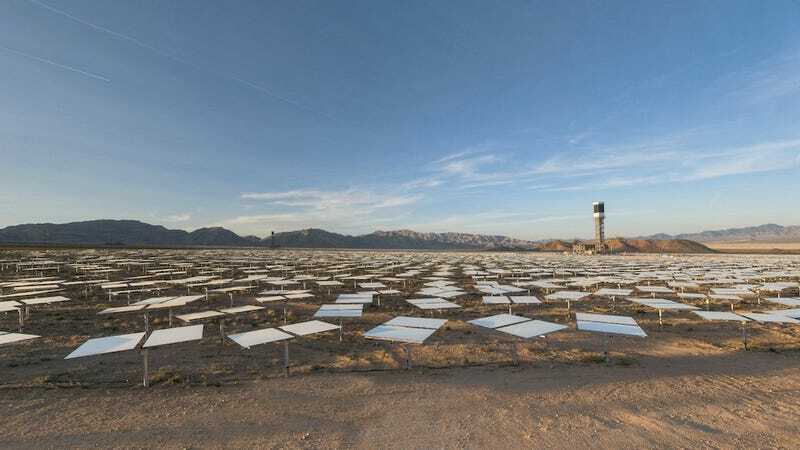 In the meantime, Ivanpah reigns supreme—check it out in all its glory on the virtual tour.